It can be easy to forget that physically challenged people often have normal or sometimes, extraordinary cardiovascular and respiratory parameters. The only specialty is that they are deficient in normal motive functions, which is where their disability even becomes apparent. Society can help create devices for them with the help of which they can move and do things like normal people, using less of their own energy. This can go a long way in bringing the best out of these people. Considering the rate at which technology is leapfrogging these days, athletes like Oscar Pistorius are very well capable of outstanding performances and giving others a run for their money, regardless of the event. You'd think there must be a good reason why we have the Paralympics and more than 20 major events under it. Making custom prosthesis for such people fascinates me as a truly purposeful and noble engineering endeavor. The question of making things inclusive to the disabled trickles down from sports to normal transportation and recreation. Why must physically challenged people not be able to ride a bike like others? I can't think of any valid reason. And if they can, are there better ways to connect such individuals to the bicycle to give them a stress-free experience? 1. Clinical Requirement : Engineers first must understand the clinical condition for which they are making the device. What is the receiver's deficiency? What is his health condition, height and weight? 2. Functional Requirement : What is the function of the device? Where will it be applied? 3. Bio mechanical Requirement : What is the biomechanics of the device when installed into the receiver's body, given a choice of coupling? What are the stresses, forces, energy conditions? 4. Cosmetics : Does it look acceptable? Like anything else, individual preference of a product often hinges on how it looks and the psychological impact it has on the user. These days, assisting devices use state of the art technology with much importance given to the materials side of things for safety and injury prevention. Devices now use carbon fiber for strength and bio compatible items like titanium bolts for socket attachment. Advanced manufacturing schemes are employed to produce the tight tolerances needed as one of the main aims can be to try and restore proper symmetry to an asymmetric body. In the middle of all this, attempts are made to even integrate wireless electronics into the prosthesis. Below are two examples outlining the kind of technology involved. While the aim of prosthesis to create something that matches the mechanical properties of the missing limb, it may not necessarily look like a normal limb. As an illustration, the image at the beginning of this post shows a bespoke prosthetic leg designed by Össur for UK track cycling star, Jody Cundy. Össur is a company based in Iceland and is a global leader in non-invasive orthopedics. Jody is an amputee who lost his leg due to a deformation condition when he was three. Össur is the same company that made Oscar Pistorius' Cheetah running blades and now has helped made Jody one of the fastest track cyclists in Great Britain by designing a leg out of carbon fiber weighing a mere 600 grams. 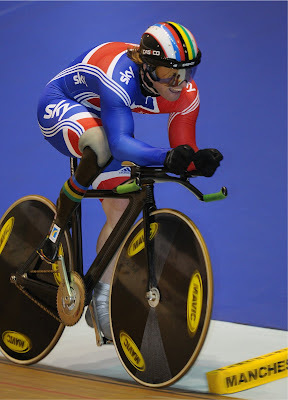 Jody approached Össur prior to the Beijing Olympics and asked them if they would be interested in making him a custom cycling leg to compete on. They jumped at the challenge and came up with the leg that he won double gold on in Beijing and the recent world championships. Iceross X5 Seal provides socket sealing to Jody's residual limb. Casting and donning instructions are can be read here. The design was kept simple, using what is called a suction socket (vacuum suspension) featuring a Össur X5 seal in liner. Advanced textiles improve durability and elasticity, and adhesion is upped by 25%. Instead of a foot attached to the base, there's a shaped piece of carbon which is moulded into the socket and finished off with a cycling cleat attached to the bottom. The cleat is a standard Shimano SPD-SL to engage with the pedals. Also observe that it is in the same place it would be if Jody was wearing a footed leg with a cycling shoe, so he doesn't create any issues with the bio mechanics of the real part of his leg. Finally, the entire product was given an aerodynamic profile for drag reduction. I'm a huge fan of the Kona Ironman in Hawaii. What truly amazed me this year was the spirit of a double above-the-knee amputee named Rudy Garcia-Tolson from California. Just 21 years of age, he made history by becoming the first individual with such a condition to finish the 2009 Ford Ironman. For those who are not familiar with this spectacular athletic event, that's 2.4 miles of swimming, 112 miles of time trialling and a full blown 26 mile marathon all in sequence without a break. Rudy is able to dream and achieve in large part because of the technologies now available in prosthesis. He uses precisely selected feet from Össur to meet each activity’s needs: the Flex-Run® for track because of its flexibility and light weight and a specially made flex foot feet (see right) . He was also one of the first bilateral amputees to go bionic with two Rheo Knees. These are also Rudy's everyday, everywhere walking legs that allow him to multi-task and do the things people normally do. Rudy has two Rheo knees, the world's first micro-processor swing and stance knee system engineered by Össur. Embedded artificial intelligence learns how the user walks and runs, and responds immediately to changes in terrain, load and speed. The knee comes with a PDA that communicates wireless to the knee via bluetooth. Click here for a technical manual. But while all this technology sounds well and good, top level competitions are merciless in terms of rules and regulations. I guess the reasons could be many why a talented athlete such as Rudy missed the Ironman's bike leg cut-off time of 5:30 pm by just 8 minutes! But note that I sat through the whole online recording of the Ironman by Universal Sports. Being a fan of Rudy, I was looking out for his performance. While doing so, one of the things I immediately spotted was Rudy's obvious difficulty in engaging the cleats under his artifical feet onto his bike's pedals. This was after he emerged out of the swim to get ready for the 112 mile bike leg. While the video I recorded below certainly may not account for 8 minutes, it nevertheless shows how time can be lost when a design doesn't necessarily work as planned. It is challenging.